Governor José Aispuro tweeted that there were no deaths among the 101 aboard, although around 85 were injured - two critically. Aeroméxico flight AM2431 was flying from Guadalupe Victoria International Airport to Mexico City. The plane crashed close to the airport just moments after take-off. Authorities said that of the 97 passengers and four crew on board, 37 were hospitalised after the crash and two were in a critical condition. The names and nationalities of those on board are currently unknown. 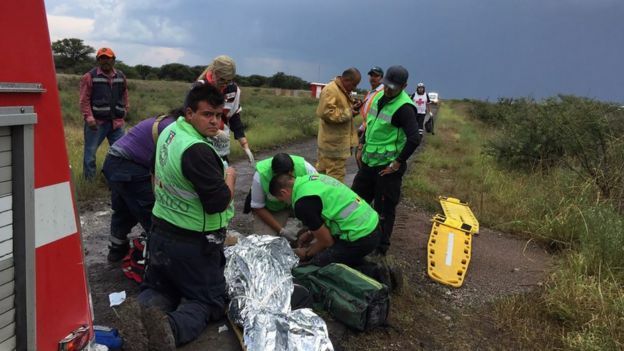 The airport operator, Grupo Aeroportuario Centro Norte, said early data suggests bad weather was the cause, with the plane taking off during a heavy hailstorm before being forced to make an emergency landing. 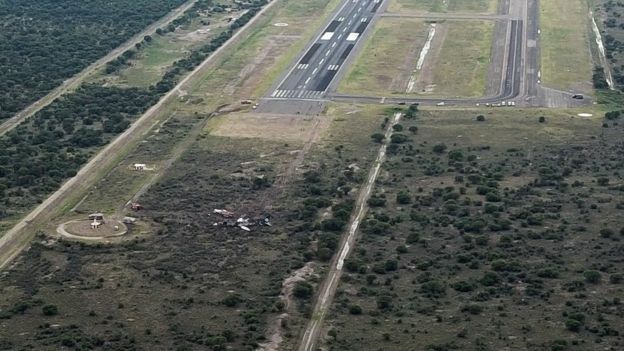 Governor Aispuro said witnesses told him there was a "bang", before the almost full Embraer 190 fell to the ground without warning at around 16:00 local time (21:00 GMT). One passenger told a local television network it felt like a strong air current hit the aircraft. Civil defence spokesperson Alejandro Cardoza said a fire which started after the crash was put out, and there were no burn victims. "Many managed to leave the plane on foot," Mr Cardoza said. All health care bodies in the state were on alert to take care of the injured, the governor said. Mexican President Enrique Peña Nieto tweeted that he had also instructed federal agencies to help. Guadalupe Victoria airport was closed after the crash. 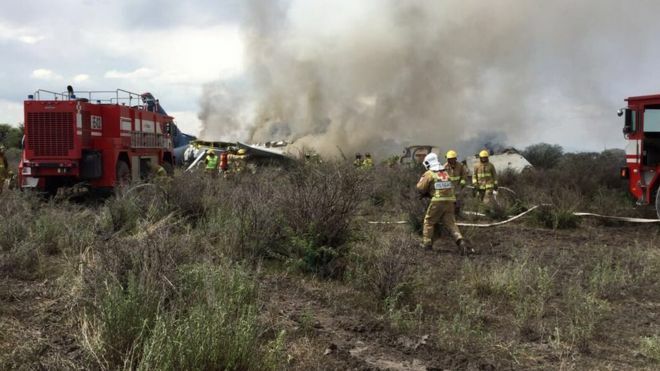 In a statement, Aeroméxico said they "deeply regret" the accident, while Brazilian plane company Embraer said they had sent a team to the crash site.